Complete the form in black ink – make sure your write clearly – be sure to mark the relevant blocks with an X (nothing else). Ascertain that you complete all relevant sections of the form – double check if you have filled out all required fields. Note: Do not attach original documents to your application under any circumstance as you may need these again – make copies of all relevant documents and take the originals with you when you go to submit your application – the DFO will certify all copies attached to your application when you show him/her the originals. Two colour passport photographs of yourself, which are not older than 3 months. A full and complete motivation stating the purpose and need for the firearm you want the licence for. A primary motivation setting out the reason why you wish to obtain the firearm and explain fully the background, and reasons. State the description or type of the firearm applied for in respect of the motivation (bearing in mind that the officials may not know the difference between a Holland & Holland worth R500,000K and a Howa worth much less). If, for instance, it is a semi-auto shotgun or rifle (you must be a dedicated hunter or sports-person), motivate (e.g. recoil reasons, female shooter and attach supporting evidence from an SME (Subject Matter Expert) - thus be detailed in your technical explanation. Provide additional and special motivation in respect of the firearm. Explain any specific and specialized technical specifications of the firearm that necessitates the acquisition. Motivate fully, supported by documentation from experts, why you need it. Also provide in full sentimental reasons such as a family heirloom with photos. In the event that the specific firearm duplicates an existing firearm calibre, detailed reasons as to why such acquisition is necessary- i.e. you already own a .308 for hunting and now need one for target shooting (bench of Bisley) which will be set-up specifically for that reason. This detailed motivation should be supported by an endorsement from the NHSA. An endorsement confirming the applicability of the calibre and firearm for the stated purpose it will be used, from NHSA, has become a prerequisite. SAPS is on record as stating that an endorsement is of high value in their evaluations for awarding firearm licences - read How To Apply Here. Attach copies of all your existing firearm licenses (take originals with you for certification of copies by DFO). A copy of the relevant invoice to confirm purchase of the specific firearm being applied for (if you have or if new one). Detailed explanation of special features related to application (e.g. Purdey vintage gun, double rifle vs. magazine rifle and why, killing power of calibre, explanation of varminting load, wildcat loads, retro chokes). List all intended species for which the specific firearm will be used, with explanations where possible (e.g. .375 needed for buffalo; 3-inch magnum special goose gun for spurwing geese). Explain where in battery the specific firearm will fit – which disciplines it will be used for in sports-shooting. For sport-shooting - explain in which exercises you will participate and attach official copies of description of such exercises - describe why the specific firearm is suited to the exercise. Give a full description of your firearm safe supported where appropriate, with documentation and photographs to show its nature, type and how and where it is bolted to the wall and/or floor, with SABS certificate or certificate from the manufacturer/seller (if available). Full details of your security facilities for example if there is an alarm, how it operates and whether it is linked to armed response; what crime is likely in your area; height of walls around the property; is there an electric fence or dogs; are there burglar bars on the windows and burglar gates on the outside doors. A series of photographs would be preferable. 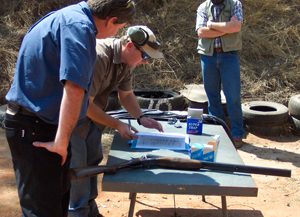 Details of any firearm training that you may have received, supported where appropriate with certificates. Also details of accumulated experience with photos. A comprehensive history of your shooting and hunting career and exposure, with photographs where available (include official hunting and shooting logbooks). Proof that you have shot or hunted at various locations, supported by photographs or testimonials or statements from fellow hunters and or landowners, photos of medals, certificates. If you participated in any competitive shooting activities furnish proof and confirmation thereof. Testimonial from someone who is a professional person or senior manager or acceptable public figure (such as a minister of religion) testifying to your character. Optional – a testimonial from a person with whom you have hunted who can confirm that you do hunt and is safe with firearm (or do sports-shooting with). As everything in life, neatness and preciseness counts a lot of marks in the eyes of the evaluator – submit a neatly bound and complete set of documents – it’s our experience that this already makes a good impression. Make a copy of your full application – applications get lost – then you can furnish a duplicate as you have the receipt to prove that you handed in your original application. A receipt proving that you have paid the relevant amounts as this also proves that you have handed in your application. Try and get a completed SAPS 523 form from your DFO – it’s not always possible as the people read in your data into their system at another time as what you are at the office – but try – it’s further official confirmation that you have handed in an application. This fact sheet is an advisory service of the NHSA for its members and is produced in good faith based on available information at time of compilation. Neither the Association nor the compilers accept any responsibility whatsoever, directly or indirectly, for the veracity of any information provided or not-provided. No guarantees regarding the awarding of firearm licensing are given or implied.